Hi everyone! I have a few cards to share with you today and I'm going to split it into two posts so they don't get overwhelming! I knew I wanted to try entering a couple more times for the My Favorite Things You Could be a Card Designer Superstar contest that ends tonight and I finally have a moment to pop them up on my blog! Be sure to check out the other post HERE. Like I mentioned in the other post, the contest ends tonight and to spark my creativity, I turned to the MFT Card Challenges. 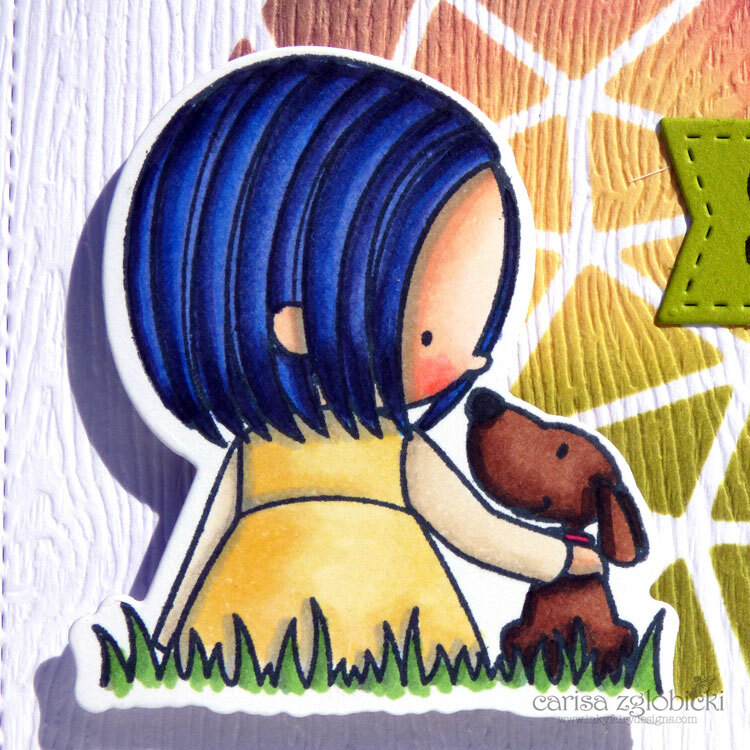 I started by using the Jumbo Peek A Boo dies to create my circle stencil. Then I placed the Abstract Stencil over that to do my ink blending. The way I blended and the colors I chose it turned into a little sunset scene which I think is just adorable. I asked my girls to go through my MFT stamp stash and each pick out a set they wanted me to use…they BOTH wanted me to use MFT BB You Have My Heart! haha That was easy! This stamp was one of the first MFT stamps I purchased and I absolutely still adore her. These images are so fun and simple to color - another bonus! I also love that their is a companion die set to make fussy cutting so much easier. My little tip since they are a closed die, die cut it first and then stamp it. I was SOOOOO nervous trying to cut her out after I had colored the stamp but luckily it worked out. It looks like we'll have hard competition from Tolla, she did an awesome job, her card look a lot better than many cards that I had made! I love it! BTW, I love the design of your card! You're entry is fabulous! And what a wonderful card from Tolla! Good luck with the MFT contest! I love your card entry!!! You did an amazing job!!!! Fantastic card, Carisa. Love your coloring. And, looks like your girls have some fun pplaying with stamp as well!